Being a mix of light blue, light green, and some dashes of yellow for vibrancy, turquoise is a unique color, which creates exotic interiors. Turquoise is definitely an attention-demanding color. It radiates the calmness and tranquility of blue, the harmony and balance of green, and the lasting happiness and inspiring energy of yellow. If you are one of those blue color-lovers who adore all its shades and tones and find its beauty everywhere around- in the sky, ocean, sea, or endless fields of flax, you certainly can not be indifferent to the magnificent hue of turquoise. If you indeed like it, you should know it is considered a royal color as associated with the gemstone named after, so be proud of yourself, you really have a remarkably good taste for colors! As already mentioned, blue represents sea and sky and reminds of expanse, freedom, boundless spaces, and unlimited possibilities. Actually, the power and charm of turquoise are in the unique balance it creates. It is soothing yet invigorating, interiors incorporating turquoise in one way or another exude pleasure and serenity but also energy and stability. Although often considered a summer shade, as it energizes spaces, when used right, with its captivating aura it is a perfect option for all seasons and interiors. In addition, all turquoise shades create a bright and joyful yet still calm and peaceful world. Here comes the good news – turquoise is one of the modern, favorite colors in interior design today, so if you are keen on this color, you are able to create a mini turquoise paradise within the walls of your own home. This might also be a great idea given the fact that both the gemstone and the color have been long known as bringing peace, happiness, and harmony. Thus, many cultures around the globe believe that it has the power to invigorate interiors creating joyful and vivid spaces. In the picture above, a fantastic eclectic bedroom with adequate natural light. 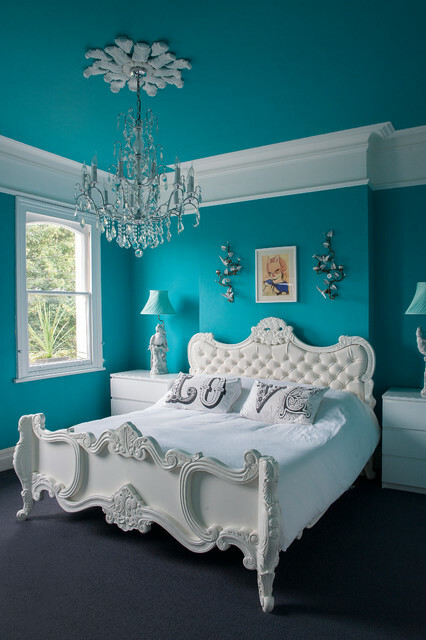 An awesome bed with an upholstered headboard stands out against the background of the turquoise walls and ceiling. White matching nightstands, crown molding, bedding, and an eye-grabbing ceiling medallion complement the bed in balancing the room. A breathtaking silver crystal chandelier adds touches of luxury and sophistication. Pairs of table lamps, wall décor, and pillow cases add visual interest and personality. Definitely a fresh, invigorating bedroom. Note that turquoise works well with velvet-upholstered furniture. Shown above, a living room flooded with natural light. A turquoise ceiling complemented by throw pillows in the same color adds energy, warmth, and touches of drama and visual interest. An attention-grabbing crystal chandelier brings in luxury and tons of personality. Unquestionably, a space with a unique look! Although some would say you have to decorate with balance and attention when it comes to this color as sometimes it can look tawdry and flashy, it is your home and choice, so feel free to experiment. However, if you don’t feel confident of you interior design decoration skills, you can always use some professional help from an expert. You can start by adding some turquoise details in decoration, which will create a vivid and energizing atmosphere in your home. From furniture pieces to throw pillows to vases, anything can do the job, the choice is entirely yours! Note that even a dash of that royal color can transform a room into a harmonic place with an organic vibe. In the picture above, an adorable living room with personality. 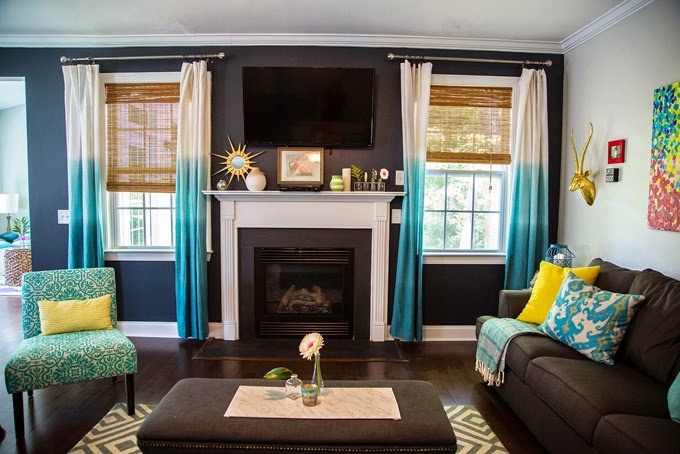 Ombre-patterned turquoise curtains work perfectly well in this space. A piece of wall art, an area rug, throw pillows, accessories, and a chair add some extra splashes of color to complete the fabulous look. 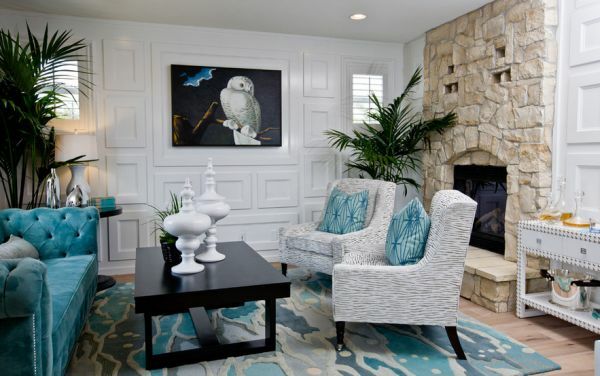 Shown above is another example of including turquoise accents in a rather neutral living room. A gorgeous rug reminiscent of an ocean’s waves and foam immediately grabs the eye. A velvet sofa and a pair of matching throw pillows add some extra doses of turquoise magic. 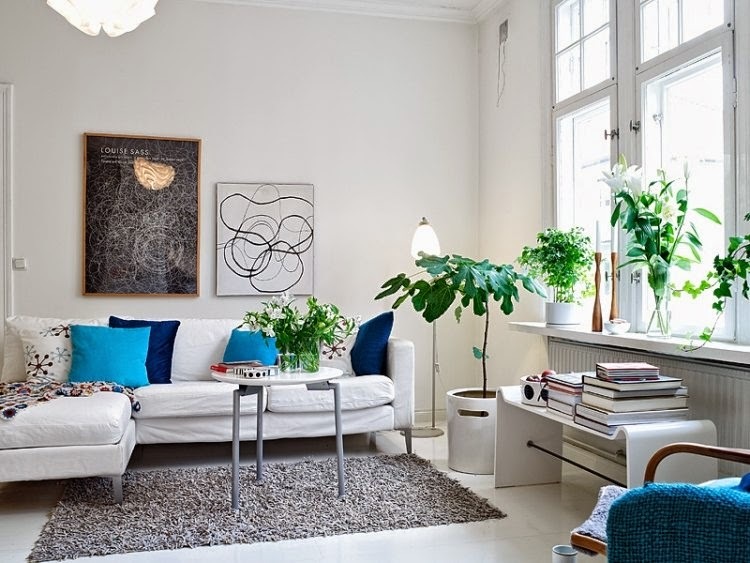 Potted plants bring in splashes of green and freshness to this definitely fascinating space. Always consider incorporating throw pillows of different size, shape, and texture, they offer an easy, simple, and affordable way to try any new trend or color. Above, a Scandinavian-style living room flooded with natural light. Throw pillows, which add dashes of turquoise, stand out against the crisp white background. An area rug brings in warmth and texture. Potted and cut flowers introduce green and add to the fresh, soothing atmosphere of the space. Pieces of wall art add extra visual interest and personality to this fabulous room of minimal design. For bolder people who love the bright side of life, turquoise is definitely a modern option for creating accent walls. In addition, as turquoise creates a sense of space and exudes energy and happiness, a turquoise accent wall is a fascinating option to add light and make a room look bigger. If you think that a living room is the only place where pops of turquoise work well, you are totally wrong. As already mentioned, this marvelous color is associated with tranquility and peace of the sky and sea. 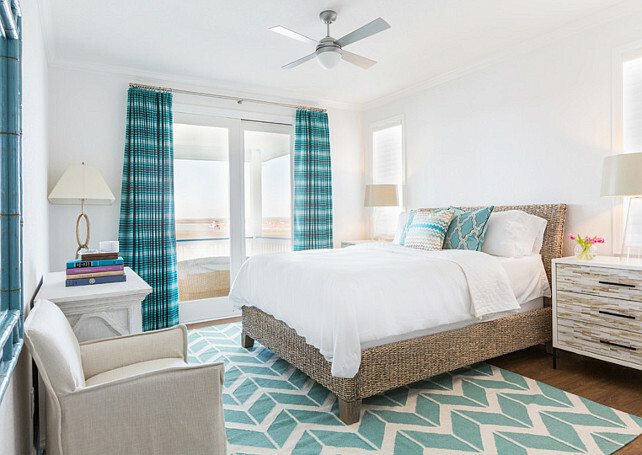 Therefore, you can hardly find a color more soothing and enchanting than turquoise for any bedroom, the place where everyone relaxes and dreams in privacy. Above, an appealing all-white bedroom of minimal design. Matching table lamps, a throw, and throw pillows introduce pops of turquoise to bring the space to the next level. A piece of artwork adds extra color and visual interest. Turquoise bliss! 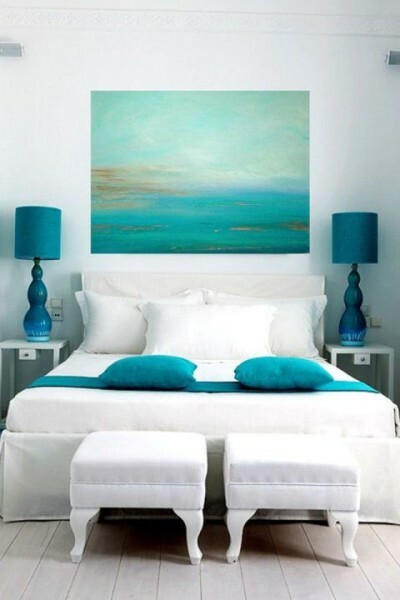 Shown above, a beach-style bedroom with turquoise accents. An area rug, window treatment, throw pillows, and a chic mirror introduce pops of turquoise to this master bedroom. A wicker bed adds warmth and an organic feel. Cut tulips bring in some extra color and freshness. So serene and adorable! Actually, as it is a popular designer choice and works well in any space and with almost any color on the spectrum, you can’t go wrong using turquoise accents. Furthermore, splashes of turquoise add touches of undeniable elegance, charm, and sophistication and help create enchanting interiors with tons of personality. In the picture above, a stunning eat-in kitchen. A turquoise island complemented by a comfy window bench adds so much charm and character. A unique lighting solution over the dining table adds visual interest. Not to mention the turquoise little bottles display, it is simply adorable! This airy, functional space is definitely trendy and stylish yet still calms the senses! 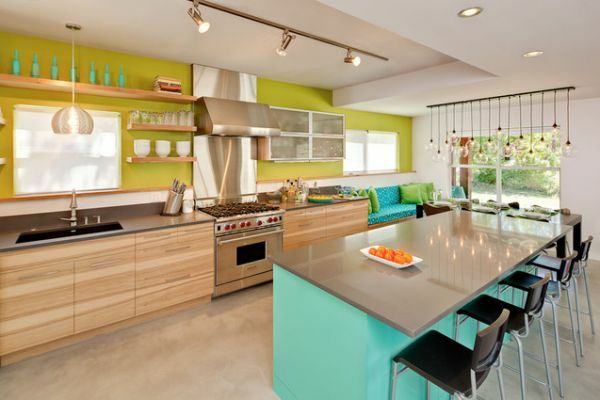 Are you adventurous enough for having a turquoise kitchen? As it is instantly associated with water, turquoise is a perfect choice for bathrooms. Adding a sense of tranquility and pureness, it helps create dream-come-true bathrooms, enchanting hideaways where to relax and renew. Above shown is a stunning bathroom with sparingly positioned pops of turquoise. Actually, this space shows how well the color turquoise works with whites and browns. A stunning area rug, towels, and accessories in turquoise are just enough to add elegance, energy, personality, and sophistication. A gorgeous chandelier adds extra visual interest to this space with adequate natural light, a distinctive architectural character, and an organic vibe. Generally, if you like spaces reminiscent of wind, waves, and romantic vacations, turquoise is always a surefire choice. It works well in all spaces and with an array of colors to create soothing interiors. When used right, whether as a main color or for introducing accents, it helps create intriguing, chic rooms that exude elegance, joyfulness, freshness, and exotics.